Since 1902, Sinai Memorial Chapel has helped families in the greater San Francisco Bay Area honor the death and memory of their loved ones. We help people fulfill their personal wishes at their time of loss and can guide them in the practices of Jewish tradition. We will be by your side to help you make funeral arrangements and mourn your loss—respecting the guiding principles of k’vod hamet (respect for the dead) and nichum aveilim (consoling the mourners). Sinai is a resource for individuals who want to make advance plans—ensuring their wishes are fulfilled and providing peace of mind for their family. And for families who are mourning, we provide grief and bereavement counseling to help them through this difficult time. 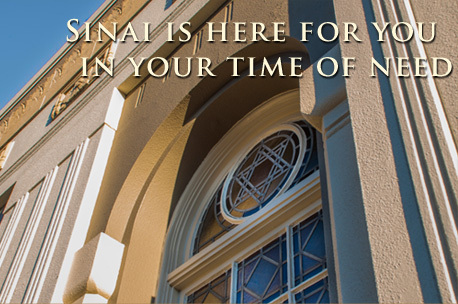 Sinai Memorial Chapel is the only Jewish funeral home in Northern California. It provides its services regardless of a family’s financial means and serves as an essential community and philanthropic resource in the Bay Area. Please call us at (877) 895-0359. We are available 24 hours a day.